Ein Eierlik�r im Schokobecher f�r die ersten 25 G�ste! The Delirians are LAs number one number Ska & Reggae group out of Californias ever growing traditional ska and reggae scene. Based out of East Los Angeles, founders Angel Salgado(vox,guitar) and Tony "teclado" Medina(organ,vox) strive to keep that vintage reggae sound alive. With tracks like "Walkie Talkie" and "Leave This Town" you_ll be sure to hear reflections of that the vintage 60s era sound adding their own flavour to create a genuinely unique sound. 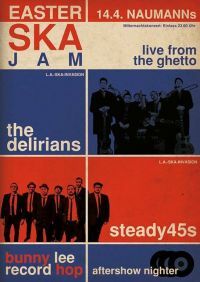 The Delirians will keep you skanking with original ska tunes and keep you grooving to some heavy rocksteady. The Steady 45s were formed in 2013 from the melting pot of the Los Angeles ska scene, and over the next four years have established themselves as the premier traditional ska/rocksteady act in Southern California. Since the beginning their sole intention has been to perfect and perpetuate the style and grace of traditional 1960s Jamaican ska and rocksteady music.